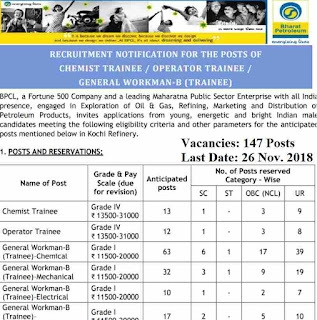 BPCL Careers making opening for 147 vacancies of fresher Trainee posts through direct BPCL Recruitment process 2018. Those who are willing to serve this organization and want a Government Jobs in BPCL can apply for this recruitment procedure. About the Organization: BPCL (Bharat Petroleum Corporation Ltd.), is a Treasure of 500 Company and this is one of the leading Maharatna Public Sector Enterprise with all India presence. BPCL Organization basically involved in Exploration of Oil & Gas, Refining, Marketing and Distribution of Petroleum Products. BPCL Recruitment department invites job applications from fresher young, energetic and bright Indian male candidates meeting the following eligibility criteria and other parameters for the anticipated posts mentioned below in this article. We explained the complete criteria and other conditions below in this article so those who are willing to apply for this BPCL Careers making opening have to read it carefully before applying online. Education: Applicants who are wishing to apply for this BPCL Careers making opportunity for this job profile of Chemist trainee must have M.Sc. in the Chemistry stream preferably in Analytical Chemistry with 60% marks (Full Time course) from a recognized Indian University/ Institute. Education: Those who have a Diploma in Chemical Engineering /Technology with 60% marks from a recognized Indian University/ Institute can apply for this job profile under this BPCL Recruitment process 2018,. Education: First Class Diploma in Chemical Engineering/Technology (Full time course approved by AICTE) with 60% marks from a recognized Indian University/ Institute. Education: First Class Diploma in Mechanical Engineering (Full time course approved by AICTE) with 60% marks from a recognized Indian University/ Institute. Education: First Class Diploma in Electrical/ Electrical & Electronics Engineering (Full time course approved by AICTE) with 60% marks from a recognized Indian University/ Institute. Education: First Class Diploma in Instrument Technology OR Instrumentation & Control OR Electronics & Instrumentation Engineering (Full time course approved by AICTE) with 60% marks from a recognized Indian University/ Institute. Age Bond: Those who are wishing to apply for the above job profiles must have age in between 18 years to 30 years. Same age criteria for applying all the above job profiles under this BPCL Recruitment procedure 2018. There is no application fee for applying this BPCL Careers making opening 2018. All candidates from India should have a valid/active email id which should be kept active till this recruitment process is over. Candidates are advised to keep the details and password of their e-mail id fully confidential and do not disclose the same to any other person. Corporation shall not be responsible for any consequences arising out of candidates disclosing their e-mail id related details to any other person. 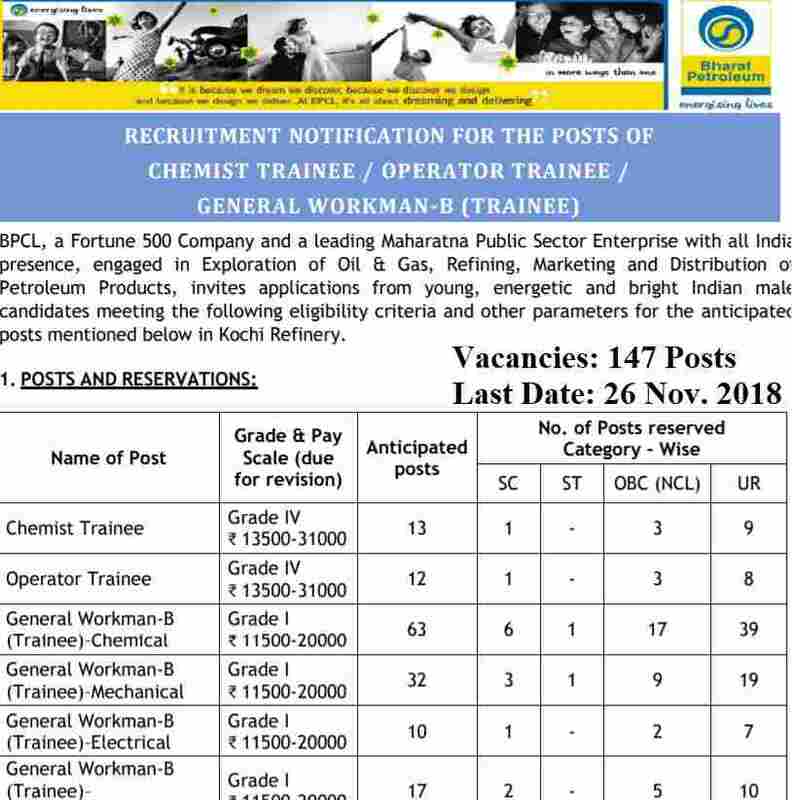 How to Apply for this BPCL Careers Making Opening 2018? The job Application are accepted through the online channel. The well Qualified applicants may apply online through the official website of BPCL recruitment department. The link will be active from 12th Nov. 2018 (10:00 hrs) and will remain activated up to 26th Nov. 2018. You have to go through the link available on the following website: www.bharatpetroleum.com>Careers. For more information check IMPORTANT LINK section at the last of this article.